There is a variety of artistic Styles in these pictures of cats. A wall painting facsimile of an ancient Egyptian Sun God is painted in the image of a cat. 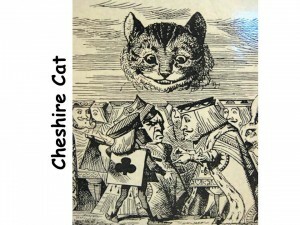 Sir John Tenniel’s Cheshire Cat was created exclusively with LINE, hatching and crosshatching. Paul Klee painted his own cat in a plain and very simple style that emphasizes GEOMETRIC SHAPE. 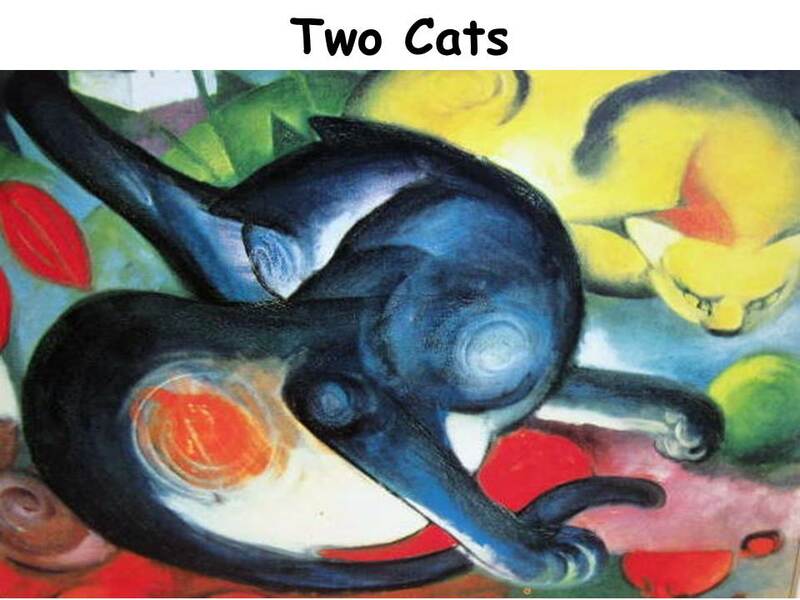 Franz Marc’s cats also emphasize GEOMETRIC SHAPE. Picasso’s painting has a dark and ominous MOOD. 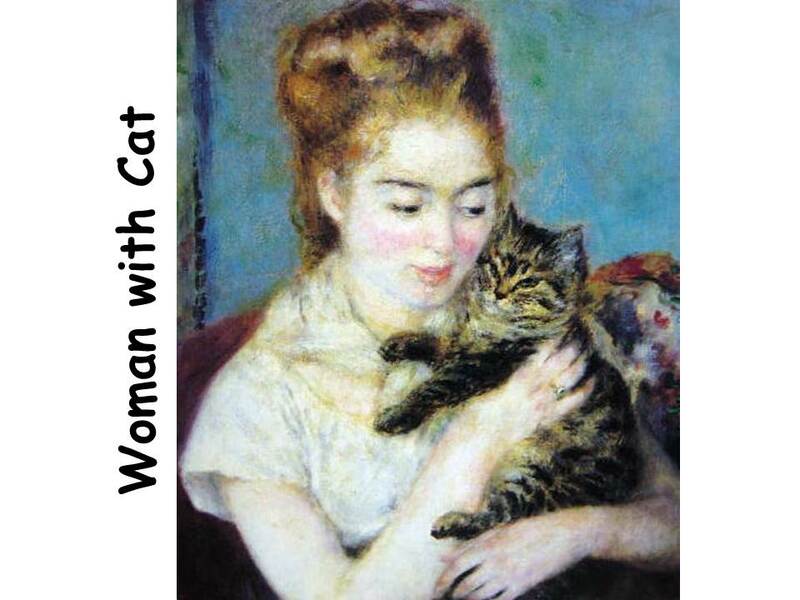 Renoir’s Impressionistic Woman with Cat is bright and lighthearted. Edouard Manet’s cat illustration is a print in black, white and shades of gray. Compare the various artistic views of the cat. Which cats are REALISTIC? Which are EXPRESSIONISTIC? Compare the various MOODS of each picture. Compare the various uses of COLOR. The original of this painting was painted about three thousand years ago, in Egypt. Since then, time and vandals have damaged the picture. In 1910, the Metropolitan Museum of Art, in New York City, sent an expedition of archeologists to study the ancient tombs of Thebes (in Egypt). The artist Charles K. Wilkinson went with them and spent twelve years in Egypt creating facsimile paintings (exact, full-size copies) of wall paintings. The vanished, ancient Egyptian civilization created many works of art that give us clues to their daily life and culture. Because of the dry climate in Egypt, much of this ancient artwork is preserved for modern people to study. Many early archeologists were not very careful unearthing ancient artifacts and this caused many of them to become damaged. Charles Wilkinson copied this painting, of a damaged wall in Egypt, onto paper. He reproduced the painting exactly as he saw it—damage and all. In ancient Egypt, cats were treasured as household pets and as symbols of fertility. Like their human companions, deceased cats were mummified and placed in a tomb to await the next life. These elaborate tombs were decorated with murals that often featured images of cats as playmates and as protectors. 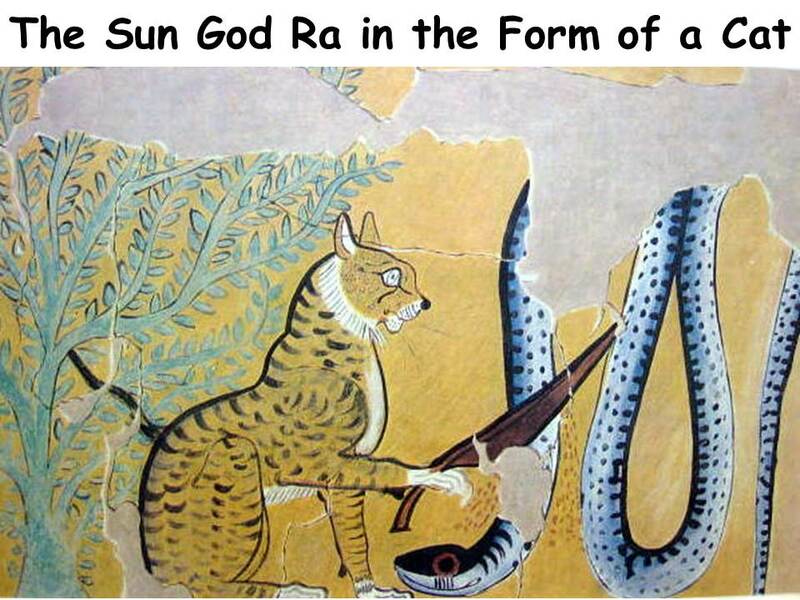 One of the most important Egyptian gods was the sun god Ra, portrayed as a cat because of the animal’s ability to see in the dark. In this painting, Ra defeats Apophis, the god of darkness, who takes the form of a large snake. Ra and Apophis represent two opposites, good (light) and evil (darkness). How many COLORS did this ancient artist use? Using only four colors—black, white, yellow and green—the ancient painter created a powerful image with bold SHAPES. Ra’s golden coloring is the same as the background, but the expressive gray and white markings create the appearance of another shade of yellow. Notice how Ra (the cat) is outlined in black to help him stand out from the background. His all-seeing eye is painted large in proportion to the rest of his body. Ra holds a reed leaf in his paw. This reed grows along the Nile in Egypt and is one of the symbols used in ancient Egyptian hieroglyphs. The snake (Apophis) has been painted to have silvery-looking skin. This was accomplished by applying a thin layer of white paint on top of an under layer of black. The white paint is thin enough to allow some of the black to show through. The snake is also outlined in black, with black and gray spots, to contrast with the yellow background. What has happened to part of the snake’s body and part of the green bush on the left of the painting? Part of the painting has chipped and fallen away. Remember that this is a very old painting. 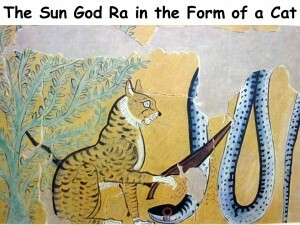 Can you think of a better way to show that the cat (Ra, the good person) has defeated the snake (Apophis the bad person)? Does it appear that the snake has lost the battle? Could a cat really pick up a reed? Does holding the reed make the cat appear more human, more like a god in a cat disguise? Does the cat seem “stiff” and unnatural to you? Can you think of a way to put more action or drama into the picture? • Paint a different picture of the sun god (RA) and the god of darkness (Apophis). Think of another way you could pose Ra triumphant over Apophis. What other animals might represent good and evil? Sir John Tenniel was born in London on Feb. 28, 1820. He received his first art training at the Royal Academy of Art in London, where he studied painting. John also studied under the illustrator, Charles Keene. Tenniel had a gift for creating illustrations (drawings that enhance the meaning of a story). He joined the staff of the weekly Punch Magazine, in 1850, and worked there as a cartoonist until his retirement in, 1901. Tenniel produced over 2,000 Punch cartoons (comics). He also illustrated more than 30 books. The book Tenniel is most remembered for illustrating is Alice’s Adventures in Wonderland, written by Lewis Carroll. The characters he drew for this book have been recreated repeatedly, in movies, cartoons and short stories, many times. The cast of characters for this story has become timeless since they were first created and they are easily recognized by even small children. .
Tenniel was so busy creating his illustrations for books and his cartoons for Punch Magazine that he had little time left for his painting. He created and exhibited some watercolor paintings but it is the more than 2,500 various Illustrations he created in his lifetime that earned him a knighthood, in 1893. Tenniel lived until 1914. 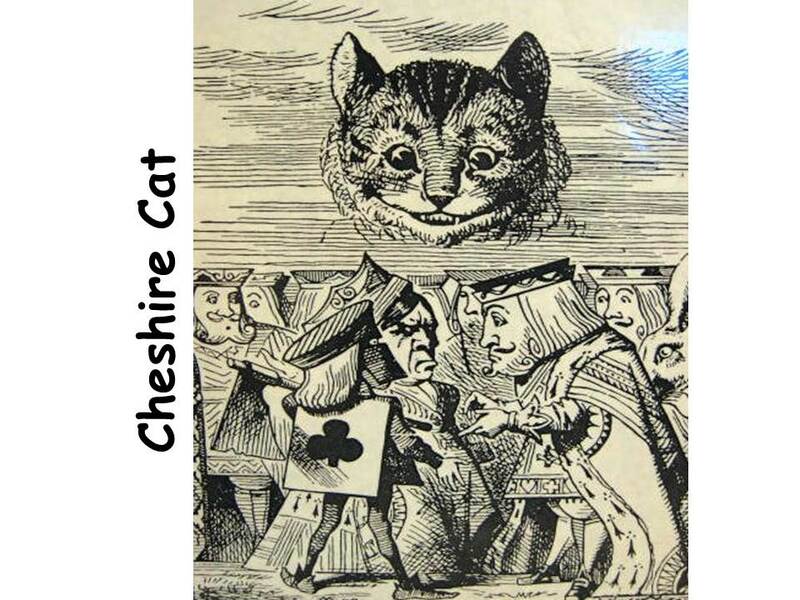 One of the fantastical creatures Sir John Tenniel created in Alice’s Adventures was the grinning Cheshire Cat. The Cheshire Cat could vanish into thin air and he was the one who explained to Alice that in Wonderland, everybody was crazy. The cat appeared at a croquet (crow kay) match, held by the King and Queen of Hearts. The Queen disliked the Cat’s lack of respect and shouted, “Off with his head!” The clever cat began to disappear, until all that remained was his face. This illustration from the story depicts an argument between the King, the Queen and the executioner on how to behead a creature that was ONLY a head and had no body. Tenniel worked from his imagination to draw these characters. He gave life to the playing-card figures of the King and Queen by exaggerating their features. The faces are large and drawn simply. Their clothing is covered with overall PATTERN. The enormous size of the cat, compared to the other characters, makes it clear that he was an important character. A Wood Engraving is made from a design carved into a piece of wood with a smooth, fine grain. After the wood is engraved, it is inked (much like a rubber stamp) and stamped with a press. This type of artwork is created using LINES. It looks much like a drawing. Overlapping lines creates the shading and shadows. This technique is called hatching or crosshatching. Adding or taking away lines can produce many shades of gray. Often wood engravings were hand colored with watercolor once they were printed. • Create any drawing using LINES. The original can be drawn with light pencil. Go over the pencil with a black pen. Discuss areas on a picture that would need shadow or shade—under the eaves of a house, the grass under a tree, the underside of a robe or coat, etc. Point out the shadow and shading in this picture. Use hatching, crosshatching and stippling to create shadow and shade in the drawing. Paul Klee (Klay) was born near Bern Switzerland in 1879. He grew up in a very musical family. His father was a music teacher and his mother was a singer. Paul learned to play the violin when he was very young and was very good at it. Paul always loved to draw. When he was little, Paul would visit his uncle’s restaurant and imagine all kinds of interesting things in the PATTERNS of the marble tabletops there. He would trace onto paper the PATTERNS he saw on the tabletops. Paul loved to show happiness and fantasy in his work. He admired pictures drawn by children. As a grown-up, he tried to recapture the imagination of his childhood in his artwork. Many of his pictures are colorful and filled with interesting lines and shapes that had a special meaning for him. Paul’s studio was called “The Wizard’s Kitchen” by his painter friend. When he was working in his studio, a clutter of brushes, scrapers, paints, bottles, chalks, paper and easels surrounded Klee. From this chaotic assortment of materials sprang paintings; drawings and sculpture that seem like visions created by a sorcerer—of a world somewhere between dreams and reality. One of Klee’s companions was Fritzi, a tiger tomcat with wildcat blood. Fritzi was not completely tame, but he was always forgiven when he knocked things over in Klee’s crowded studio. His powerful hunting instinct was Klee’s inspiration for Cat and Bird. Klee exaggerated the size of the cat’s eyes to represent the extraordinary vision of cats. Two arcs above the eyes describe the concentration typical of a hunting feline. The heart-shaped nose represents Klee’s affection for Fritzi’s independent nature. Klee has created an image that seems more like a primitive mask than a portrait of his cat. 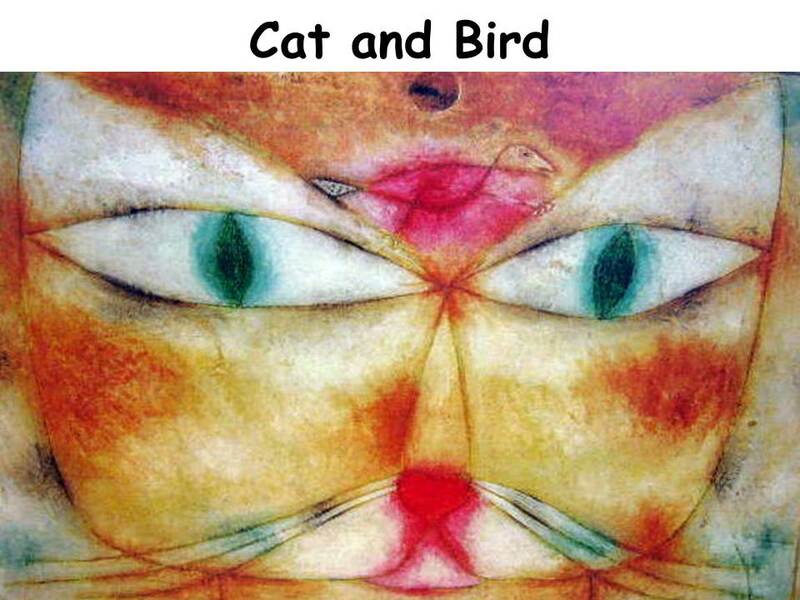 While this painting was wet, Klee scratched in the outlines that shape the cat and the bird. After the paint dried, he filled the scratched outlines with black ink. • On a piece of white construction paper, lightly draw an imaginary face of a cat. You could make his nose in the shape of a heart, the way Klee did or in a triangle. Draw in a simple sketch of a bird. Make sure the face fills the entire page. Look closely at Klee’s painting. See how it is a very close up view of the cat’s face. Notice the top of Klee’s cat. What kind of ears does he have? Next, color this picture using a small piece of sponge and watercolors. Color the same way Klee did—with thick patches of color. Do not use a paintbrush, only a sponge. Do not wipe across the paper with the sponge, but dab lightly with it up and down to create TEXTURE. After the paint has dried, go over the pencil lines with black color crayon or marker. • Use clay to sculpt only the face of a cat in HIGH RELIEF. Don’t forget to leave a hole for hanging. • Use clay to sculpt an entire cat in FULL ROUND. Use a toothpick to add TEXTURE LINES and other details. Franz Marc was born Feb. 8, 1880 in Munich, Germany. His father was also a painter. At the age of 20, Franz entered the Munich Academy to study painting. In 1903, Marc made his first trip to Paris where he studied the styles of many modern painters, including impressionism and cubism. He tried some of their techniques in his own paintings. During the early 1900s, Germany was very prosperous and experiencing rapid industrial growth. Franz Marc believed many of the German people were obsessed with power and money. He was depressed with the greed that surrounded him in Germany. Marc searched for the meaning of life in nature. He believed that animals had a special, innocent power that humans couldn’t spoil. He is best known for his animal images that are the expression of his deep union with all creation. Marc created a visual language, using COLORS and SHAPES to express his idea of the natural strength, courage, and goodness of animals. The colors he chose were not the natural colors of animals. He chose radiant, bright colors that gave the creatures in his paintings independent and joyful life. He also borrowed some ideas from the Cubists (using geometric shapes) and Abstractionists (creating images that represented real things but were not painted in a realistic way; additionally referred to as EXPRESSIONISM). Marc entered the army when World War I broke out. He stopped painting but kept a sketchbook. On March 4, 1916, he was killed at Verdun. He was only 36. The two cats in this painting are doing things you usually see cats doing. The blue cat is busy washing himself. The yellow cat is coiled up, ready to attack. At first, it seems the yellow cat is fixed on a toy—the green ball. Then you notice that the red mouse in the FOREGROUND is really the target. Can you see the mouse’s tail in the corner? Franz Marc used color to express the cats’ characteristics. Blue was a male color, representing strength. Red meant aggression. Yellow was a female color. By mixing colors to create new SHADES, he changed the meaning of the original colors. For example, he mixed red and yellow to create a patch of orange, which expresses the yellow cat’s fierceness. Marc painted circular forms on the shoulder and hindquarters of the blue cat to emphasize its strong muscles. He suggests that the blue cat is a fighter. 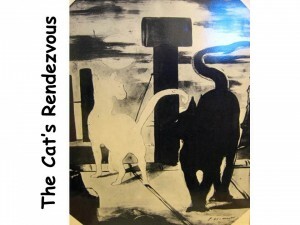 He outlined the yellow cat’s features in black and gray, to show its intense concentration. These two cats stand in a Landscape painted in bold PATTERNS and intense COLORS. With the little white house in the background, he hints at the remote—and unnecessary—presence of people. Are these cats painted realistically? They are painted in Abstract. They represent something real but they are not painted Realistically. Cats are not blue. Create cat pictures using red, yellow, blue, green and orange colors only. Have the cats doing something—playing with a ball of yarn, chasing a bird, wrestling with another cat, eating, sleeping, or clawing a tree. Pictures could be created using paint, color crayons, marking pens or cut and glued construction paper. Pablo Ruiz Picasso was born in Malaga, Spain in 1881. Picasso’s father was an art teacher at the local school. He encouraged his son to paint and draw. He wanted Picasso to become a great artist someday. When Picasso was 19, he left Spain and went to Paris, France. Some of the first paintings he did there look a little bit like the work of other famous French artists. They remind people of artists such as Toulouse-Lautrec, Van Gogh, Gauguin and Monet. Picasso’s painting style changed over the period of his life more than any other great artist did. He was always trying new and different things, things no one else had tried before. His originality made him a great artist. Picasso lived to be 92 years old. He died in France in 1973. In the spring of 1939, Europe faced the darkest years in modern history. The Nazi German dictator Adolf Hitler had already taken over the countries of Austria and Czechoslovakia. He now threatened to gobble up Poland. Pablo Picasso recognized Hitler’s hunger for power and he created this powerful image as a warning. 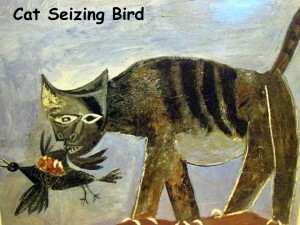 In Cat Seizing Bird, Picasso identified Hitler as a sinister cat destroying the dove of peace. The predatory cat grips the earth in his razor like talons. The bulging stomach of the cat (representing Hitler the Dictator) shows his greed. The face seems like a nightmare come to life, with one eye on the helpless bird, the other staring blankly at the future. Picasso drew the cat’s head in a simplified shape that resembles a demon mask created by many of the world’s primitive cultures. He used dark and cold colors—greenish black, gray and brown—to focus our attention on the fiendish beast. He painted a few white outlines on the cat to emphasize the sharp angles and to separate it from the background. Five months after Picasso signed this painting, France and England declared war on Germany. As a Spanish citizen, Picasso was not called to military service. He remained in France throughout the German occupation and used his paints and brushes as weapons of protest in the struggle for peace. Does this cat look realistic? Does it seem friendly? Would you like to pass this cat on the sidewalk? Do his claws make him look dangerous? Does his face resemble a cat at all? • Create a DANGEROUS, mean cat. He can even have a human like face. This cat is doing something that is very natural for a cat to do. Picasso has made this cat look dangerous and mean by changing his face and using dark colors. How has he changed the cat’s face? Is it realistic? Having one wing of the bird torn shows that the cat is dangerous. Sharp teeth and claws also look dangerous. • Create just the FACE of a dangerous cat. Change it to make it seem frightening by looking like a mask. It should be Expressionistic or Abstract, not Realistic. Color the face with a THICK layer of crayon. Do not color the background. When the coloring is finished, paint over the picture with thinned, black tempera paint or black watercolor. The paint will resist the crayon if the crayon and the background will be dark. This will help make the cat seem more dangerous and mean. Cecilia Beaux (Bow) was born in Philadelphia in 1863. Her aunts raised her in Philadelphia after the death of her mother. At the age of 15, Beaux decided to become a professional artist. In 1888, she moved to Paris and studied at the Academy Julian. After two years, Beaux returned to Philadelphia and established her reputation as a portrait painter. In 1895, she became the first full-time woman teacher at the Pennsylvania Academy of Fine Arts. During her lifetime, Cecilia Beaux was recognized as one of the great American portrait painters. Beaux died at Gloucester, Mass., on Sept. 17, 1942. 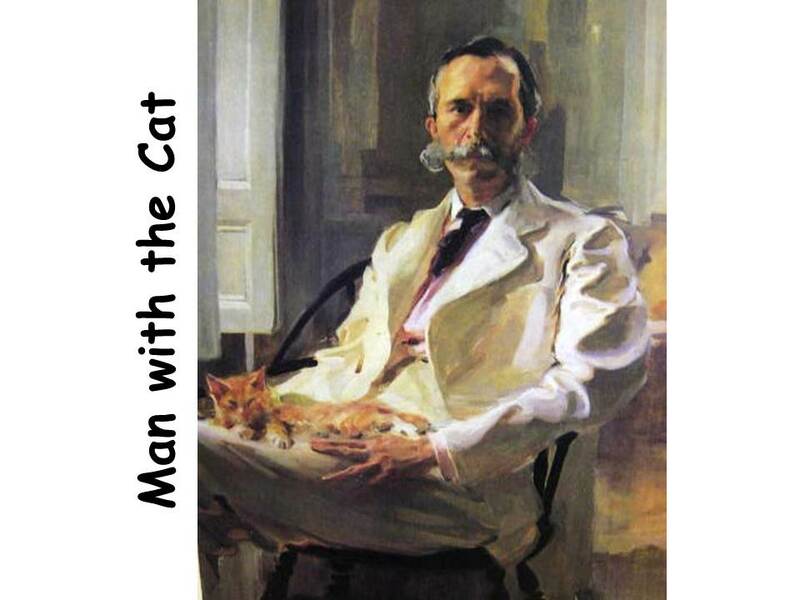 The “man with the cat” was Beaux’s brother-in-law, Henry Sturgis Drinker—a distinguished attorney for the Lehigh Valley Railroad who also specialized in forest management. Beaux captured Drinker’s dignity and his affection for an orange calico cat that clearly enjoys having its toes stroked. Beaux created the effect of sunlight playing on pale surfaces with energetic brush strokes. She painted drinker’s face with bold patches of color and added just enough detail to define his features. The shadows on his face add an air of sadness, in contrast to the bright light. Beaux captured the essence of relaxation in the cat’s facial expression. To form the soft texture of its fur, she feathered in an ivory glaze over the underlying orange shape, using small brushes. Beaux suggested a luxurious living room with large blocks of pale gray, cream, and rose in the background. Does anyone in this class own a cat that looks like this one? Does the light and shadow of this painting give you any clues about where the man is sitting? The man’s leg and lower part of his arm are in shadow. The top edge of his arm and the front of him are light, as if sunshine is reflecting off him. One side of his face is in shadow, the other side reflects sunlight. It appears he is sitting in front of a window with wooden shutters and light pouring in. Notice the squinting, half-shut, relaxed eyes of the cat. Have you ever seen a cat do this with its eyes? Where do you see VERTICAL LINE? HORIZONTAL LINE? DIAGONAL LINE? CURVED LINE? Which area of the painting has the DARKEST COLOR VALUE? • Write a paragraph about what this man is thinking as he sits with his cat on his lap, looking out the window. Did he have a hard day at work? Does it help him to relax to tickle the toes of his cat? Did he have a good day and is he just sitting here thinking about how good he feels? What happened before this moment? Write down his thoughts. Speak as if you were the man who is thinking as he looks out the window. • Write a paragraph about what the cat is thinking. What kinds of events happened during this cat’s day? Discuss the things that might happen to a cat during a day. What kind of a day did the cat have—a good one, an exciting one, a relaxing one, a scary one, a busy one, a lonely one? How does he feel about the man whose lap he is sitting on? Renoir was born in Limoges, France on Feb. 25, 1841. His mother was a seamstress and his father was a tailor who moved to Paris, where the 13-year-old Renoir was apprenticed to a firm of porcelain painters. After the company went out of business, Renoir enrolled in an art school. Many artists studied art in Paris in those days. Some of them became very famous. Renoir knew many of these artists, including Claude Monet, Paul Cezanne, Alfred Sisley, Camille Pissaro and Fred Brazille. Renoir was not from a wealthy family. Money was a major driving force behind the subjects Renoir painted. He often earned money by getting a commission for a portrait. His agent also told him to paint still life, landscapes and traditional paintings of women, which were popular subjects for the public to buy. Many of the subjects he chose to paint were decided on by his need for money—he painted what would sell. Renoir had arthritis and it worsened as he got older. He found it increasingly difficult to hold his brushes and eventually had to have them strapped to his hands. In his later years, he was also confined to a wheelchair. Despite his severe physical disabilities, Renoir continued painting up to the last year of his life. Renoir died at the age of 78, on Dec. 3, 1919. Renoir has captured an intimate conversation between a young woman and her pet in this Portrait. Where is the girl looking? She is looking down at her cat. Does anyone own a cat that looks like the one this girl is holding? It looks like she is talking to her cat. What might the girl in this painting be saying to her cat? Do any of you talk to your pets? Where do you see the LIGHTEST COLOR VALUE in this painting? Which area of the painting has the DARKEST COLOR VALUE? How many objects can you see in the painting? Draw or paint a portrait of someone (a child, an adult) with a cat of his or her own. They could be playing with the cat, holding it, sleeping with it, petting it, posing formally with it, feeding it, scratching behind its ears, pulling its tail, playing dress up with it. It could be a serious or a funny picture. Manet was born in Paris on January 23, 1832. He was raised in an upper-middle-class family. Manet studied to become a naval cadet and failed. He then studied art and in 1861 had one of his paintings, The Spanish Singer, accepted by the jury of the official Salon. In those days, an artist could become successful when the official Salon of Paris accepted one of their paintings. The Salon was the only place where an artist could hope to have his work seen by large numbers of people. Then Manet started painting “modern” pictures. None of the paintings he submitted in the 1863 Salon were accepted, but there were so many dissatisfied artists that the Emperor Napoleon III permitted an exhibition of rejects, the Salon des Refuses, to run at the same time as the official Salon exhibition. Manet showed his paintings with this group who became known as the “Impressionists”. In the 1860’s, Manet became recognized as the leader of the younger generation and fellow-rebels such as Edgar Degas and Claude Monet. His friendship with Monet encouraged him to experiment with painting outdoors and to use brighter colors more consistently. In 1878, Manet began to suffer from pains in his legs, which was a symptom of a nerve disease. Manet continued to paint as his legs became increasingly worse. On April 14, 1883, his left leg became gangrenous and had to be amputated, but the operation failed to save him. He died 16 days later. Manet was only 51 when he died. Manet was very fond of cats. He made this ink drawing in preparation for a lithograph that was used to illustrate an article on cats, which was published in October 1868. This image was also used as a poster advertising another book on cats, Chats, in 1869. Notice how the lighter cat is basically created as an outline. The rest of the picture is created in black and shades of gray. The light colored cat is simply one of the few parts of the picture that has no ink. Create a cat drawing on white paper very lightly with a pencil. Go over the pencil lines to paint a BACKGROUND with DARK, LIGHT and at least two MEDIUM VALUES of gray. Paint in shadows with black paint. Create a variety of GRAY COLOR VALUES for the picture. Reminder! Always begin with WHITE and slowly add a drop at a time of gray to create DARKER GRAY VALUES. DO NOT try to lighten a DARK VALUE by adding white. This is just a waste of paint. It will take far too much paint to lighten a very dark gray and you will never be able to use all the paint in a single picture!